For many people, turning on a tap or faucet and enjoying an unlimited amount of clean water in their homes and work places for washing, cleaning and bathing is something they take for granted. But clean drinking water is becoming a precious and rare resource around the world, so it is therefore essential that we reduce our consumption of water or at least substitute fresh water with an alternative water resource as well as optimise our water use efficiency through water recycling. Recycling our water isn’t just for renewable energy experts or environmentalists, it is something every household can and should do. Do we really need to use fresh clean drinking water to wash our vehicles, or to water the plants and gardens during the summer months, of course not, but we could use recycled water that has been filtered and cleaned instead. Recycled water is an alternative water resource made up from collected rainwater (rainwater harvesting) and wastewater from the house. This alternative recycled water is called Grey Water, and in many instances, grey water can replace fresh water, saving you money by reducing the amount of mains tap water your household consumes. Grey Water, also known as “sullage” is another type of home recycling system that can also be thought of as a renewable energy resource. Grey water, surprisingly enough is not actually grey-coloured, but in its broadest terms is any wastewater from the bathroom, laundry and garden, which can be reused or recycled for other purposes to reduce the consumption of, or reliance upon, the clean mains drinking water supply. Grey water is therefore the basic component of domestic wastewater, which has not originated from the toilet or urinal. Lets get one thing clear here, grey water is recyclable wastewater collected separately from household sewage water and as such this water must not be used for human consumption. Grey water is wastewater which originates from washing clothes, bathing and showering water, or from bathroom and utility sinks, in other words, water from baths, showers and sinks. It is not wastewater from the kitchen sink which contains fats and greases, dishwashers which contains chemicals and detergent soaps, or dirty waste water from toilets and urinals. Waste water from these sources is called Black Water and should not be reused or recycled in the home. Black water is polluted water and potentially toxic with a high risk of contamination by bacteria, viruses and pathogens so should never be domestically reused or recycled but sent to the sewerage system where it is given proper industrial treatment. However, greywater from the bathroom sink or shower can be used domestically to fill and flush the toilet and there are many grey water recycling advantages and disadvantages. So now we know that “grey water” is recycled water from sinks, showers and baths, but what can we use it for. Conventional home plumbing systems dispose of wastewater via sewers and septic tanks. But grey water provides the perfect opportunity to reuse this wastewater for other purposes including flushing your toilet, washing the car and also for your irrigating the garden, and with the proper equipment and filtering, the water can be used and recycled again and again. 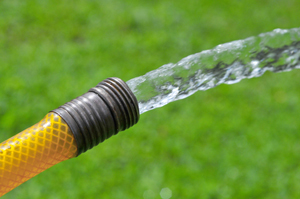 Grey water for irrigation is by far the most common and easiest way to recycle water. Rainwater from roofs and gutters can be collected in water barrels, water butts or tanks, called “rainwater harvesting”, and used directly in the garden or stored for later use. Have you ever noticed how your flowers, plants and grass always look much better after a rain storm. This is because mains water has been treated for human consumption and therefore no longer contains the nutrients and minerals required by your plants and lawns. Grey water irrigation is best used in conjunction with a pumped irrigation system which operates underneath the garden soil. By using it in this way, any problems of contamination by bacteria will be greatly reduced because the wastewater is under the soil were it comes into contact with the roots of the plants providing the most benefit. In most cases recycled rainwater is clean and ready to use, it can even be used for the irrigation of indoor plants, but waste water from showers and sinks may contain soap, shampoo and/or hair which can be removed through a grey water treatment system of filters and purifiers. But you do not want hazardous chemicals seeping into your land and killing your plants, especially if it’s an edible garden. So a diy filtering system can remove most of the larger particles and smaller contaminants from this grey water long before it ever reaches your garden or the ground. Most grey water filtering systems can even store the water in large containers for when you need it most. Many cities across the world and the United States are already using recycled grey water and rainwater for golf course irrigation, localised garden areas, and also for watering recreation parks and sports grounds. In fact anywhere where the trees, bushes and plants need watering with some cities taking water conservation and water recycling even further by using treated grey water for maintaining decorative park fountains, ponds and other such large inner city landscape impoundments. While this type of use of rainwater and treated grey water is good for large areas and cities, if you’re recycling household wastewater from showers and sinks, a good filtration system is the key. Wastewater from the clothes washing varies in quality from wash water to rinse water to second rinse water, so you need to think about what kind of soaps, shampoos and detergents you are using in the home. If you are thinking about installing a grey water system in the home to reduce your consumption of freshwater, its a good idea to switch to environmentally friendly soaps and cleaning products which do not contain hazardous phosphates and which are also low in sodium content. Phosphates and sodium will degrade the soil over time and may kill your plants if the water is used for irrigation, so think about what you are putting into the water first. If you are building your own green and sustainable home or remodelling an existing one, incorporating a grey water system into the design with solar pumps, particle filters, grey water treatment systems and wastewater storage tanks buried in the garden is a good idea allowing you to save water so that it can be put to much better use. Also you could use recycled grey water after treatment to mix the cement and concrete during the homes construction. The use of recycling wastewater into Grey Water can greatly reduce your water bills and reduce your community’s need for large and expensive waste treatment plants. Because so many of us enjoy using and maintaining our gardens or would like to clean our cars every weekend, it is important that we find new ways to store and reuse wastewater. Purchasing a wastewater storage tank, making the necessary plumbing connections to the home’s wastewater or rainwater drainage system, and properly filtering of the recycled grey water to make sure the water is safe for reuse may seem expensive and a daunting task. But it can help ensure that future generations enjoy the same clean drinking water supply straight out of the tap that many of us take for granted today. To learn more about “Grey Water”, or to explore the many grey water recycling advantages and disadvantages of how grey water can be used as an alternative water resource, then Click Here to order your copy from Amazon today and find out more about choosing, building and using grey water systems and water recycling in the home. A new law, initially pursued by Portland-based Central City Concern, will legalize the reuse of greywater in Oregon. Property owners will be able to legally harvest wastewater from bathing and laundry, then treat the water and reuse it for irrigation and other outdoor applications. The Oregon Department of Environmental Quality will create a grey water and waste water use permit process during the coming years, to reflect the new standards. Passage of House Bill 2080 is the culmination of a two-year effort by Central City Concern and other partners to improve water conservation at multifamily buildings. Central City Concern manages more than 1,400 affordable housing units. The nonprofit teamed with the Cascadia Region Green Building Council and other groups to produce a detailed report called Achieving Water Independence in Buildings.